FEMA offers Individual Assistance after a disaster to help begin your recovery. Our Individual Assistance page offers you a look at the steps and options available to you. Registering online at www.DisasterAssistance.gov, is the quickest way to register for FEMA assistance. If you are unable to access the internet, you can also call at 1-800-621-3362. The Federal Emergency Management Agency, U.S. Small Business Administration (SBA), volunteer groups and other agencies are at Disaster Recovery Centers to answer questions about disaster assistance and low-interest disaster loans for homeowners, renters and businesses. They can also help survivors apply for federal disaster assistance. The California Governor's Office of Emergency Services provides up-to-date information on the response here. FEMA, Cal OES and partner agencies are working together to review all available housing options to meet the temporary/short-term and permanent/long-term housing needs of those affected by the wildfires. Applicants may register for FEMA assistance and your registration will be reviewed for all housing options offered by FEMA and Small Business Administration homeowner, renter, business, and nonprofit loans. We understand there is no one-size-fits-all housing solution. Eligible applicants will be identified and contacted by FEMA directly to discuss available options under the direct housing program. We also want to encourage survivors to actively seek their own personal housing solution that will best suit their recovery needs. In addition, local government officials, community-led organizations, and partner agencies are working together to help locate and secure affordable housing which may be found on local and county government websites. Survivors can apply online at DisasterAssistance.gov or by phone at 800-621-3362 or (TTY) 800-462-7585. Applicants who use 711 or Video Relay Service may call 800-621-3362. The toll-free numbers are open 7 a.m. to 10 p.m. seven days a week. I have homeowner’s or renter’s insurance. Survivors who have insurance must contact their insurance company and file a claim. FEMA cannot duplicate insurance or other benefits. However, FEMA may be able to help survivors with uninsured or underinsured losses or if their insurance settlement is delayed. Applicants should notify FEMA of their situation and provide insurance company documentation. I was referred to the Small Business Administration (SBA). If prompted, homeowners and renters should apply to the SBA, even if they are not sure they will need or want a loan. Applicants not approved for an SBA loan may be referred back to FEMA for possible additional grants. I was approved for housing, now what? FEMA assistance may be available for eligible applicants in the form of grants to help pay for temporary housing, such as renting a place to live temporarily, as well as home repair or replacement. This may include renting an apartment, house, travel trailer or staying at a hotel, bed and breakfast or Airbnb. Applicants who have been notified as being eligible for Transitional Sheltering Assistance (TSA) may stay in an approved hotel or motel for a limited period of time and have the cost of the room and lodging taxes covered by FEMA. For those who are eligible, FEMA will authorize and fund, through direct payments to participating hotels/ motels, the use of hotels/motels as transitional shelters. The applicant is responsible for all other costs associated with lodging and amenities, including, but not limited to incidental room charges or amenities, such as telephone, room service, food, etc. Uninsured lodging expenses may be eligible for reimbursement under the Individuals and Households Program (IHP). Displaced survivors who were already staying in hotels are encouraged to register with FEMA and submit their lodging receipts to FEMA. Receipts may be uploaded at DisasterAssistance.gov. Survivors who registered and did not submit receipts may contact FEMA for guidance in submitting documentation. Options may include direct housing, such as manufactured housing units, travel trailers and direct leasing options. Potentially eligible applicants will be identified and contacted by FEMA directly to discuss available options under the direct housing program. Disaster Recovery Centers (DRC) are open to provide residents impacted by the California wildfires with local, state and federal disaster resources. DRCs are operated by the State of California and the Federal Emergency Management Agency (FEMA) in partnership with other federal, state and local agencies. Survivors can talk with disaster recovery center personnel about their challenges recovering from wildfire damage, get started on applying for SBA low-interest disaster loans, receive helpful recovery information and discuss other issues of concern. However, it is not necessary to visit a DRC to receive FEMA assistance. Survivors are encouraged to register with FEMA before visiting a disaster recovery center if possible. Homeowners, renters and business owners in of any of the designated counties for individual assistance – Butte, Lake, Mendocino, Napa, Nevada, Orange, Sonoma and Yuba – can seek help at any DRC. The quickest way to apply for federal assistance is online at DisasterAssistance.gov or through the FEMA mobile app. Survivors may also apply by phone at 800-621-3362 (voice, 711 or VRS) or 800-462-7585 (TTY). Because of high demand, lines may be busy. Please be patient, and try calling in the morning or evening when call volume may be lower. The toll-free numbers are open from 7 a.m. to 11 p.m. ET, seven days a week. 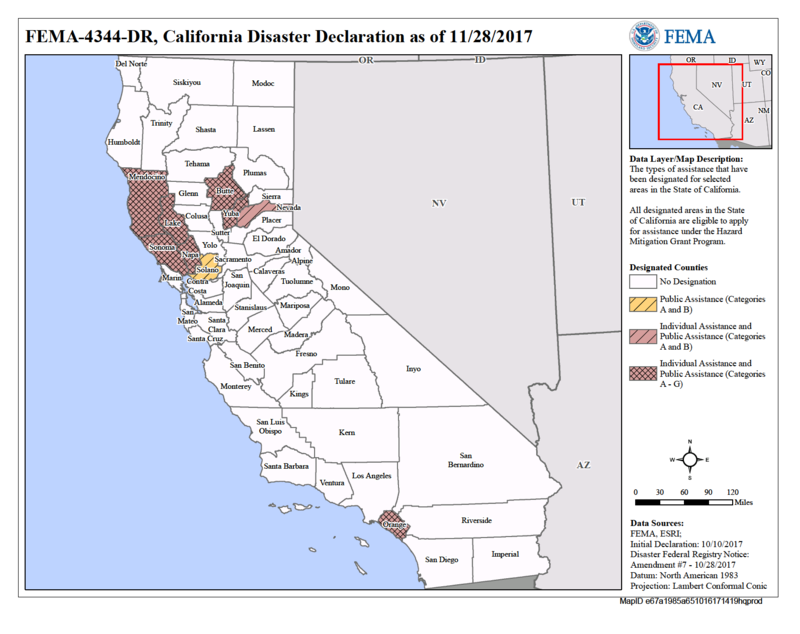 SACRAMENTO, Calif. – The five Disaster Recovery Centers (DRCs) in Lake, Mendocino, Sonoma and Yuba counties, and the Local Assistance Center (LAC) in Napa County will be closed on Thanksgiving Day. Hours of operation will change beginning Monday, Nov. 20. Address of the damaged primary residence. As more centers open, survivors may locate a center near them at fema.gov/disaster-recovery-centers or by calling the FEMA helpline at 800-621-3362. That information is also available on the FEMA mobile app. Survivors may register at any open DRC, even out of state. Representatives from the Federal Emergency Management Agency (FEMA), the California Office of Emergency Management (Cal OES), the U.S. Small Business Administration (SBA) and other agencies staff the centers. Residents of the designated counties – Butte, Lake, Mendocino, Napa, Nevada, Orange, Sonoma and Yuba – can seek help at any of the six centers. State and federal recovery officials urge California residents to watch for and report any suspicious activity or potential fraud from scam artists, identity thieves and other criminals who may try to prey on vulnerable survivors of the October wildfires. Beware of anyone claiming to be from the Federal Emergency Management Agency (FEMA) or the state visits, calls or emails asking for an applicant’s Social Security number, bank account number or other sensitive information. Avoid scam artists who promise a disaster grant and ask for cash deposits or advance payments in full. Know that federal workers do not solicit or accept money. FEMA and the U.S. Small Business Administration (SBA) staff never charge applicants for disaster assistance, inspections or help in filling out applications. Do not give out information and report people claiming to be government workers to local police. Provide your Social Security number and banking information only when registering for FEMA assistance, either by calling 800-621-3362, TTY 800-462-7585, or going online at www.DisasterAssistance.gov or the smart phone FEMA App. If you use 711-Relay or Video Relay Services, call 800-621-3362. Operators are multilingual and calls are answered from 7 a.m. to 10 p.m. seven days a week. Ask to see the inspector’s identification badge. All federal employees and contractors carry official, laminated photo identification. Inspectors also have each applicant’s nine-digit registration number. FEMA inspectors never require banking information. It is important to note that FEMA housing inspectors verify damage, but do not hire or endorse specific contractors to fix homes or recommend repairs. They do not determine your eligibility for assistance. Use licensed local contractors backed by reliable references. Demand that contractors carry general liability insurance and worker’s compensation. Ask for the charity’s exact name, street address, phone number, and Web address, then call the charity directly and confirm that the person asking for funds is an employee or volunteer. Request a receipt with the charity’s name, street address, phone number and Web address (if applicable). Anyone with knowledge of fraud, waste or abuse may call the FEMA Disaster Fraud Hotline at 866-720-5721 or report it to the Federal Trade Commission at www.ftccompliantassistant.gov. You may also send an email to DHSOIGHotline@dhs.gov. I tried to apply, but the system said I have already applied, what should I do? You may go to the closest Local Assistance Center or Disaster Recovery Center for assistance or contact our Helpline at 1-800-621-3362. Be prepared to verify your identity with a valid government ID, voter registration card, or social security card. I tried to apply, but the system said I have already applies, what should I do? You may search for other general frequently asked questions at fema.gov/faq.